Our arcade features loads of fun for all ages, including air hockey, three basketball games, two Ice Ball/Skeeball games, four race car driving games, two motorcycle riding games, four shooting games, an Elvis pinball machine, Ms. Pac-man, Galaga, claw vending machines, a photo booth, plus several prize and candy dispensing games. 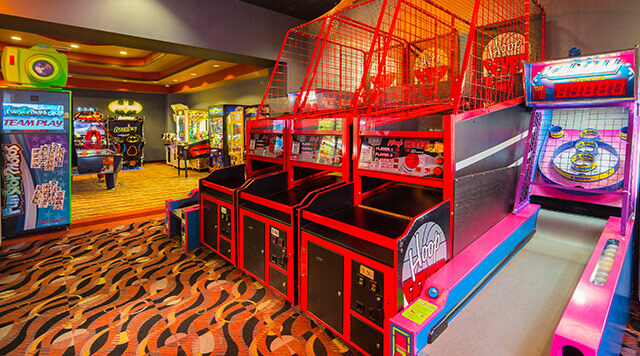 The arcade is located on the hotel's second floor corridor between the hotel elevators and the casino second floor. Anyone under 13 years of age must be accompanied by an individual 16 years of age or older at all times. No food or drink of any kind should be placed on the games located in the Arcade. Please place trash in receptacles provided. Please do not attempt to remove jammed coins from the games or coin exchange machine. Contact the arcade attendant or call the number located on the machine for assistance. Anyone caught abusing any games, using inappropriate language, or causing a disruption for others will be asked to leave the arcade area immediately. Sunday - Thursday 10:00 a.m. - 11:00 p.m.
Friday - Saturday 10:00 a.m. - midnight.